Create your very own Disney world! From Disney and Pixar's greatest films comes a set of Pint Sized Heroes. 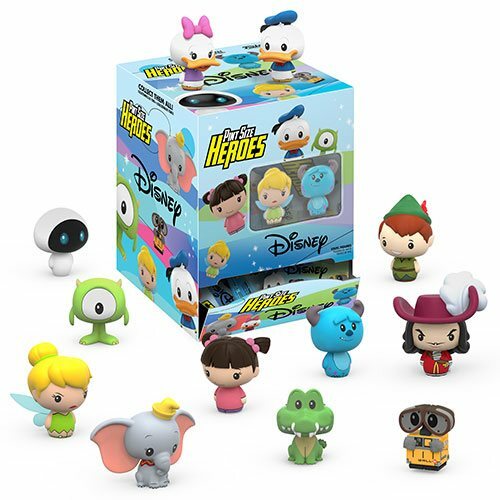 Series 2 includes Donald Duck and Daisy Duck, Dumbo, WALL-E and EVE, from Monsters Inc. comes Mike, Sulley, and Boo, from Peter Pan comes the crocodile, Tinker Bell, Peter Pan, and Captain Hook, and more! Your favorite characters measure approximately 1 1/2-inches tall. The Disney Pint Size Heroes Mini-Figure Series 2 Random 6-Pack includes 6 mini-figures.